Workforce360 meetings provide business and education leaders with the opportunity to collaborate, build a stronger workforce statewide. 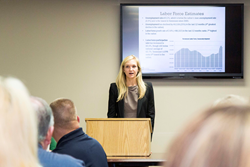 Sally Avery, from the center of economic research in Tennessee, discusses trends in employment. The Workforce360 meetings have been instrumental not only with initiating, but also continuing, the dialogue between businesses and state departments, creating a win-win opportunity for everyone involved. More than 40 people attended the first Workforce360 meeting for the Southwest region in August at the Southwest Human Resource Agency in Henderson, Tennessee. Among the businesses and departments gathered were the Tennessee Department of Economic and Community Development, Tennessee Board of Regents (Community and Technical Colleges), Tennessee Department of Human Services, Tennessee Department of Education, Tennessee Reconnect and tnAchieves. During the meeting, several state departments and businesses discussed programs that would strengthen the regional workforce. By 2020 two-thirds of all jobs will require post-secondary education. According to research, programs such as employer-sponsored tuition assistance would strengthen employees and grow the workforce. Southwest Human Resource Agency’s mission is to enhance the quality of life, promote self-sufficiency and alleviate the effects of poverty. Through the Workforce Innovation & Opportunity Act (WIOA — a federally funded job-training program), residents, some new to the workforce, veterans and persons with disabilities participate in local activities. The goal is to increase employment, job retention, earnings and skill attainment. WIOA career specialists are co-located with Southwest Human Resource Agency in several counties. Other services available include job search and placement assistance through American Job Centers, career counseling, assessment of individuals’ employability, adult education (including HISET) and English as a Second Language. Anyone may visit Southwest Human Resource Agency career specialists through WIOA. More information about Southwest Human Resource Agency is available at (800) 372-6013 or online at http://swhra.org/about-swhra.